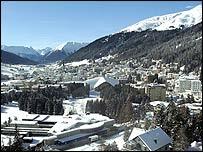 More than 2,000 business leaders, politicians and campaigners are getting together for five days at the World Economic Forum (WEF) in the Swiss mountain resort of Davos. BBC News Online explains what it is all about. 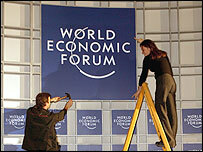 It is effectively a talking shop for high-powered business leaders and politicians from around the world. They are joined by artists, academics, religious leaders, trade unionists and campaigners from organisations such as poverty action group Oxfam, or the African Women's Development Fund. Their programme is packed with lectures, discussions and workshops - sometimes eight or nine running in parallel. Apart from the talking, the forum is mainly a networking event, an opportunity to meet with friends and rivals, and to get close to high-powered people. The forum's main event is its annual meeting, usually held in the Swiss mountain resort Davos, but it has also branched out into a series of regional meetings. As every year, the agenda stays close to current events. Under the heading "Partnering for Prosperity and Security", topics include 'reconstruction in Iraq', 'transatlantic tensions', 'corporate governance' and 'global warming'. Broadening the horizon are softer themes such as the 'curse of spam', 'creativity as comparative advantage', and 'books that have shaped our thinking'. The Forum also offers an opportunity for politicians and other leaders to make keynote speeches or launch major initiatives, such as Bill Gates' $200m grant to fund health research. The guest list reads like a cut-down version of the who-is-who of business and politics. This year's forum will be attended by corporate bosses including Michael Dell, Bill Gates, Cisco's John Chambers, Nandan Nilekani of Infosys, Philip Knight of Nike, and Sir Martin Sorrell of advertising giant WPP. The list of top politicians includes UN Secretary General Kofi Annan, Pakistani president Pervez Musharraf, WTO boss Supachai Panitchpakdi, and Argentine president Nestor Kirchner. 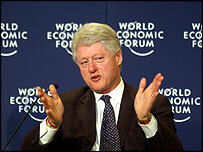 Former US president Bill Clinton will also return to give a keynote speech. But note the "former". During the 1990s, the Clinton administration sent dozens of officials to bask in the Davos sun. The current US government, however, has yet to show as much interest in the forum's international vibes - although this year Attorney General John Ashcroft will do the honours. Being in the news also boosts your chances for an invitation, with Georgia's president-elect Mikheil Saakashvili on this year's guest-list. As was Paul Bremer, the US administrator in Iraq, until his cancelled at the 11th hour. He invited European chief executives to meet in January 1971 in the Swiss mountain resort Davos, and discuss business strategy. The forum has been targeted repeatedly by anti-globalisation campaigners, and this year will be no different. The forum's organisers, however, insist that this is all about "improving the state of the world". One of this year's sessions actually runs under the heading 'Globalisation or Deglobalisation - what is best for the World's poor? '.